Soho and the world’s longest escalator. The pandas laid in the sun, not moving, not even twitching a leg, a whisker, nothing, we stood watching and talking amongst one another waiting for any signs of movement but alas in the end we gave up. 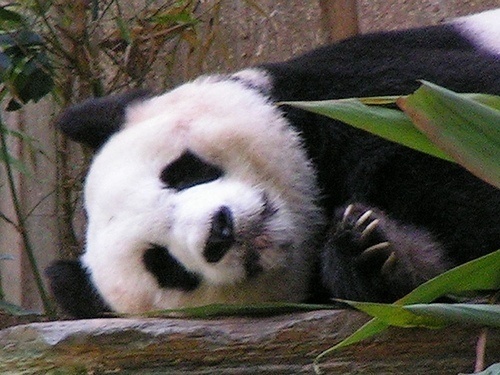 The pandas had most likely chewed its way through a bundle of bamboo before settling on a nice, long morning nap. I had seen pandas before in a safari park in Japan but to be so close to mainland China, the real home of the panda to only see An An and Jia Jia, the famous pandas of Ocean Park in Hong Kong bask in the sun snoozing was a little bit disappointing. Next door to the panda enclosure though were the mischievous otters splashing around in the water, scrambling over rocks and catching the odd fish or two that the keeper would occasionally throw out to them. It was first established in 1977 and now has over 5 million people visit annually, nearly 500,000 more people than Disneyland. 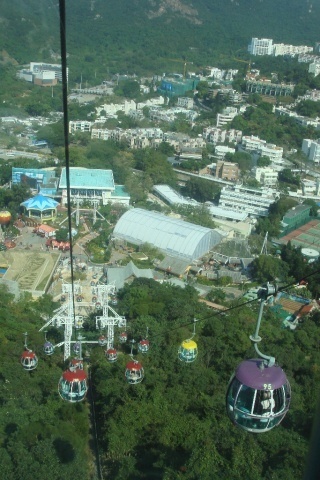 Ocean Park is a large, extensive park, with two lands the Waterfront and the Highland, which are separated by Hong Kong’s mountainous terrain. 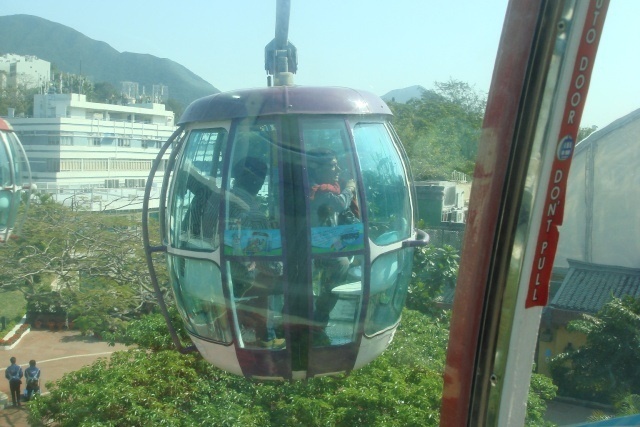 There are three different ways to move between the lands, a shuttle bus, a train or by far the best way to travel the 1.5 kilometre long cable car, which offers great views of Hong Kong. 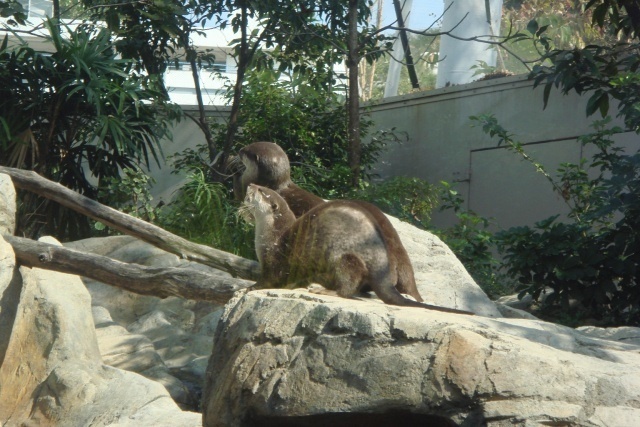 Waterlands attractions mainly deals with animals. 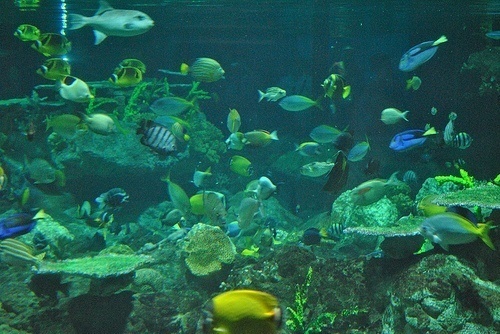 Ocean Park overall has eleven animal exhibits and caters more for the younger children while the Highlands have the ocean attractions including the four story Atoll reef, which has over 2,000 fish swimming in and around the waters including a couple of sharks and rays. While the ocean attractions are located here, the rides for older children and young at heart adults are also here including two roller coasters. “Rei why don’t you try this” encouraging him to ride the mine train, a steal mine train roller coaster, perched on the edge of a cliff overlooking Aberdeen harbour. The encouraging words must have worked, Rei notoriously famous for being a chicken decided to queue in line, as we got closer though “mummy, daddy let’s go I don’t want to ride it”, tugging on our shirts. In the end Rei backed out but it didn’t stop mum and dad from having a good time. I hadn’t rode a roller coaster in at least ten years probably more but this ride gave me a scare I wasn’t expecting, it looked kind of short, nearly a young child’s first step towards teenage hood ( if that’s even a word) but it wasn’t like that at all, with its twist and turns, covering 678 metres of track and at a height of 85 metres tall. I think I’ll stick with the local train next time. 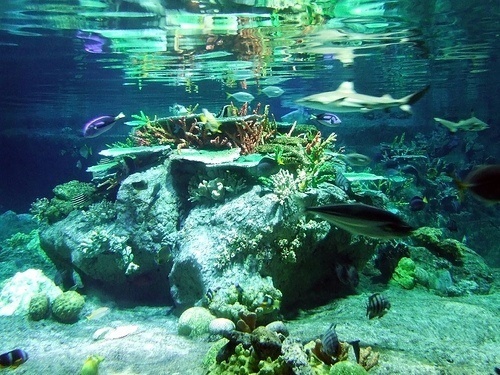 Ocean Park may lack the magic of Disneyland but if your into rides and thrills you’ll more than enjoy Ocean Park. Enjoy the day at Ocean Park before having dinner at JUMBO a famous floating restaurant in Aberdeen which you can walk to from the park. 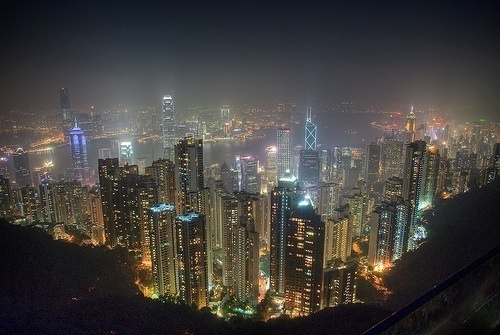 The Peak, Hong Kong’s skyline. 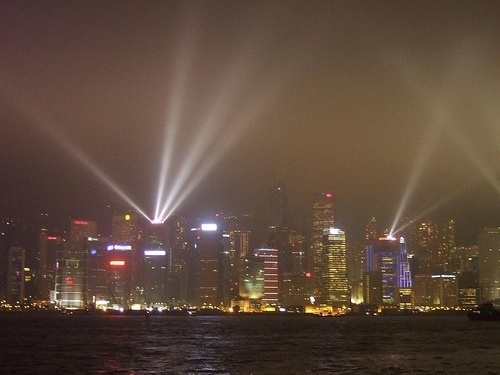 Hong Kong’s skyline looks different at night, the light illuminates the city adding a more vibrant feel to it, the water of the natural harbour is full of darkness except for the lights of the odd Star ferry crosses the waterways. The city is abuzz with people dining or having a drink. 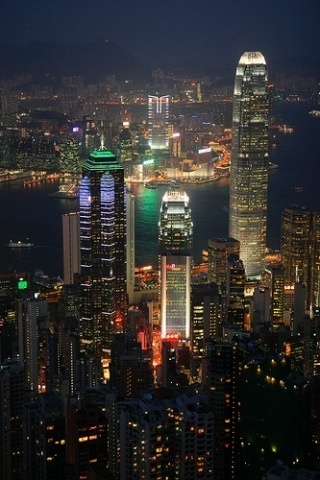 Hong Kong really does feel like a city that never sleeps. 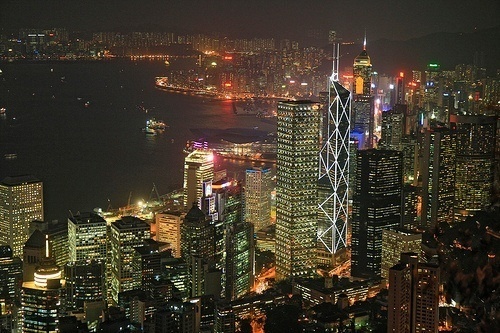 To observe the best night views of Hong Kong or even possibly the world is to go to what is known simply as The Peak. You can reach The Peak by bus, taxi or The Peak Tram, which is an attraction in itself, but be prepared to wait if you chose the tram as The Peak as over 7 million visitors a year with most of the people chosing to take the tram up the 552 metre mountain that hauls people every 10 to 15 minutes. Even though the queue was long, no one moved when a taxi driver, while waiting for the lights to change shouted from his car “line too long, 2-3 hour wait, I’ll take you”.People didn’t believe him, thinking he only wanted money or people wanted to ride the traditional way, but had we known that the driver was telling the truth, we wouldn’t have hesitated to take the taxi. Two and a half hours we waited, our patience, wearing thin the words “come on, come on” being muttered not once but at least a half-dozen times. The tram finally trudged our way up the peak. The Peak first came to relevance when the wealthy were looking for the perfect retreat from Hong Kong’s scorching Summer heat. Houses and residents moved in but at the time there was no tram and the original residents reached their homes by sedan chairs, which were carried up and down the slope by about six people who were employed by the residents . Can you imagine being pulled down a mountain by six people on their shoulders. The Peak Tram came to life in 1888 and the rest is Hong Kong history. Once on top, you guessed it the trams station is on the basement of The Peak Tower which is basically a shopping mall. 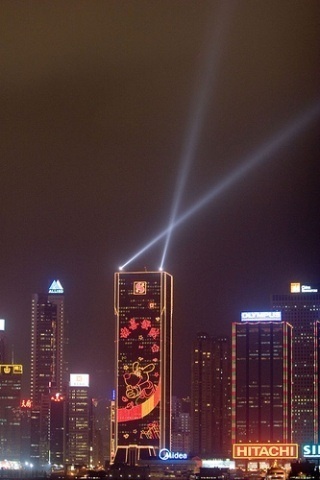 It’s Hong Kong it has to be located in a mall, doesn’t it? The Peak Tower has the Madamme Tussards wax museum, for restaurants, which were all full to capacity when we were there and of course the view. 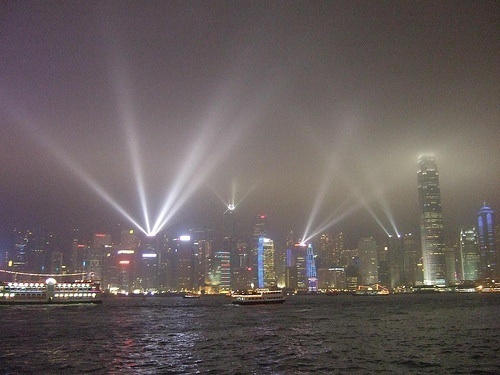 The view, how shall I describe this, is like a sky full of stars at night, twinkling, brightly in the sky, with sparkles of blues, green red and white lights illuminating the night skyline, the shadowy, silhouette water of the harbour. 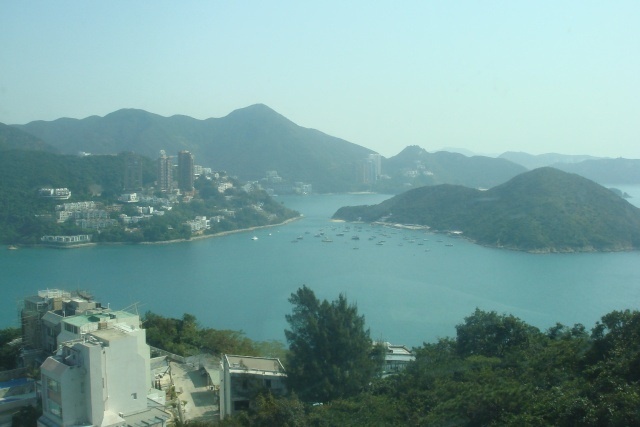 The views overlook Central Hong Kong,Victoria harbour and the surrounding islands. 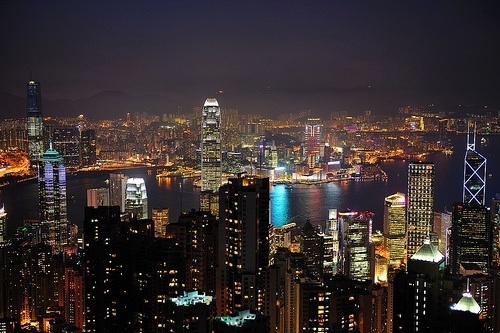 This is Hong Kong’s number one attraction and people often rave about The Peak, and often come here twice on their trip, once at night, once during the day. I’m not going to lie it is beautiful, maybe I would even say stunning but I wouldn’t use the word breathtaking that many people use. Maybe it was the crowds or the long wait but I wouldn’t go again if I were to go to Hong Kong.I might if my arm was twisted and my Travbuddy really wanted to go and check the view during the day, which I believe there wouldn’t be as many people. Take the peak tram from Central, around a 10 minute walk from Central station. There are plenty of signs to follow. The queue looked long for the cable car, something I did not want to wait for having waited for over two hours for the Peak Tram I asked the attendant “How long is the wait?”, “around an hour” ,” an hour, Do you know when the next bus is?” “Yes it leaves in five minutes”.There was no need to say anything, Hitomi looked at me before nodding and saying in unison”BUS”. By taking the bus we missed out on the 5.7 km cable car, you can see spectacular panoramic views of the hilly terrain, the sea and the city of Lantau island. Big,huge, gigantic all words needed to describe Tian Tan, the big buddha, which happens to be the world’s largest seated outdoor bronze buddha. It soars 34 metres into the air. 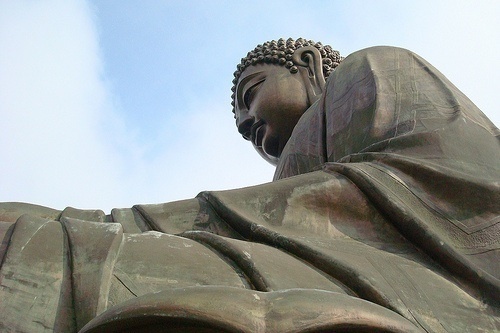 The big buddha is located on Ngong Ping plateau on Lantau island near the Hong Kong airport. 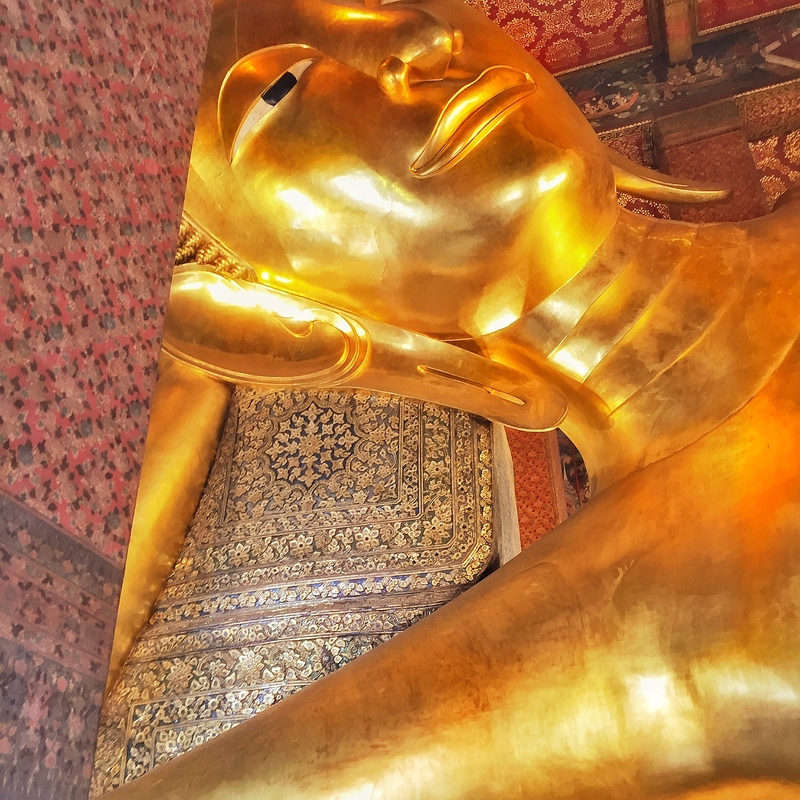 It sits on a lotus leaf above 268 steps. Half way up we started running, racing one another to the top, the Rocky anthem would have been blaring in the background had it been a seen from a movie, the winner raising his hands in triumph, jumping up and down yelling “ROCKY, ROCKY”. 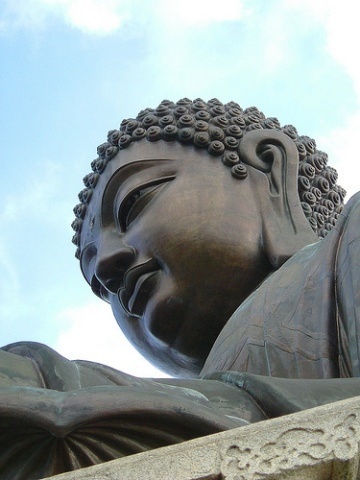 The buddha was impressive I took my time circling the Buddha taking in the 202 bronze pieces that it took to make. Its right hand raised representing the removal of affliction, while its left hand rests on its knee, signifying human happiness. six smaller bronze statues surrounds the buddha holding offerings to it. 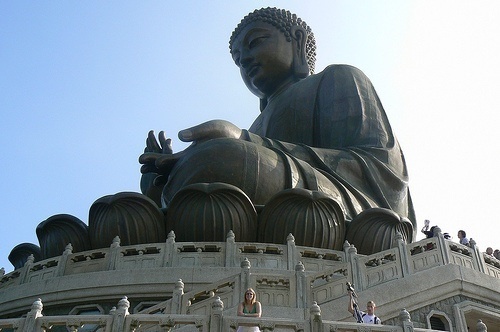 Not far from the big buddha is the Po Lin Monastery. 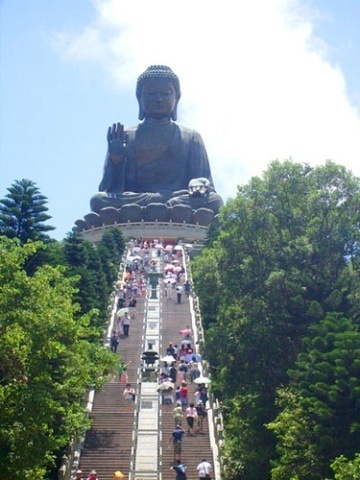 It was built by three zen masters in 1920.It is still active today in the buddhist community of Hong Kong. The incense filled the air but it was smokier than the incense I’m used to in Japan. There at the monastery it burnt with a thicker stick looking more like a fire cracker than something to purify your body. Lunch at the monastery is highly recommended, only serving vegetarian food. You can see the monks go about their daily activities.Unfortunately we did not know about this at the time. They do however have a food stall serving vegetarian food And Hong Kong sweets.The tofu that we ordered was nice covered with a sweet sauce we also ate two sesame dumplings and a custard tart. 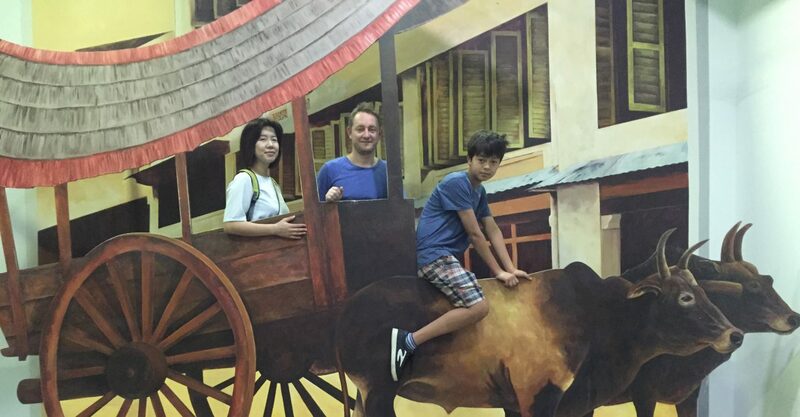 Walking back, we wandered through the village of Ngong Ping, a reenactment of a Hong Kong village. The village is filled with souvenir shops and a few other attractions that we never entered, at the end of the village is the cable car station and this time there was no queue, few people and we could enjoy the views back down. Christmas time in Hong Kong means one thing sales,yes S-A-L-E the people like a swarm of bees looking for honey move from shop to shop in search of a bargain of a lifetime. 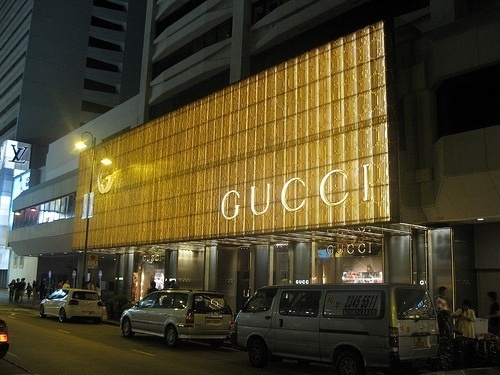 The Chinese wait in line to enter brand name shops such as Gucci, Luis Vuitton and Chanel. 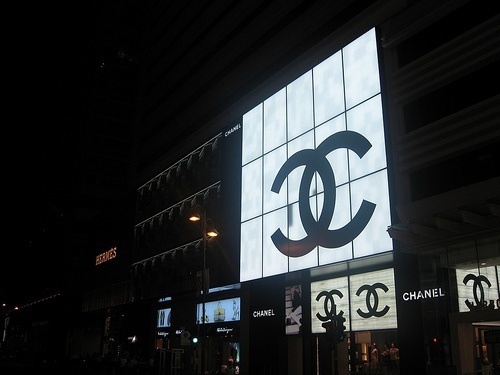 Closets in China must be as large as some bank accounts, if the massive bags they hold are any indication. 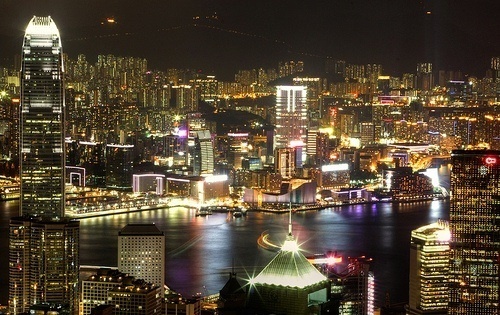 The people, the flashing neon lights, the traffic, the shops, the hectic hustle and bustle of the city is what has made Hong Kong so famous with people returning year after year to experience the country that until 1997 was under British control. I’m staying in the Marco Paulo hotel, one of four Marco Paulo hotels located in the Harbour City shopping mall on Canton road which happens to be the largest mall in Hong Kong with over 700 shops and 50 restaurants. 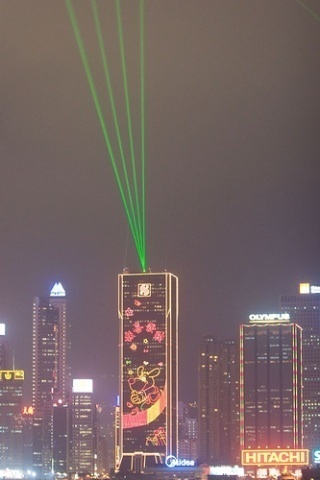 It’s so big it stretches from the Star Ferry terminal in the south to the top of Tsim Sha Tsui to the north. Walking around the mall, you can’t help to enter some of the shops with Sale marked in big red and white signs in the window, you know, everyone knows but the shop assistant in the shop still manages to tell you that today everything in the shop is 20-50% off, just in case you hadn’t seen any of the signs announcing it. With that extra initiative shown by the assistant everything in the shop looks so much better and before I know it I’m handing over my hard earned money. The assistant smiles before handing over a bag and wishing you a Merry Christmas. Yes, Christmas you think with a seven year old with you, Santa better come, the mall is like a maze, turning left then right, round in circles, shops blending into one another looking the same, well they are all selling clothes and accessories aren’t they but don’t tell the Chinese that. “Lets go this way” my wife says, following her like a robot following commands before she realises she’s been here before. We turn back the way we came, then turn left and right before I say”We’ve been here before” Are you sure, my wife says looking frustrated. Yes that’s the HMV where we bought the CDS”. We turn around again before I ask a doorman in a black, sleek uniform where ToysRus is, the largest one in Hong Kong. “First go straight, down the stairs”before he breaks out in Chinese, arms flaying up and down, left and right. This place is even too big for staff to simply explain. I smiled and thanked the man. ” Chris, Chris I think it’s this way” called out my wife. ToysRus was large, sections of toys, puzzles popular character figures, mobile cars,Lego you named it they had it, a child with all his Christmas’s coming at once “I want this one, this one and this one”, cried out Rei jumping up and down. The flight, the crowds, the shops all getting a strain on us, we joined the swarm of bees by moving to the boardwalk where Hong Kong stars names line the pavement, no names ring a bell except for the statue of Bruce Lee but we are not here for this the real reason we are here is the Lights of Symphony shown every night at 8pm. The 20 minute show of dazzling lights flashing up and down left and right to the pulsating beats of music so cleverly synchronized to the movements of light , green lasers shoot out of building tops like a scene from Star Wars, the lasers crashes or slashes its way against the lights, first slowly then building up with rhythm and pace in the background in a faint voice I may have heard “Together we can be bigger than the empire, together we can rule the galaxy” and just like that the lights stop. The swarm like they’ve had enough honey for one day diverse their separate ways, until the magical hour of 10am when the shops re open for another day of sales. The swarm will need their honey and the shops will be their haven. 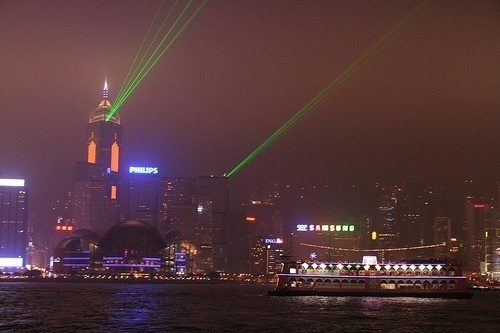 Have you been to Hong Kong at Christmas time? Did he crowds get to you? We would love to hear at We All Travel Together. 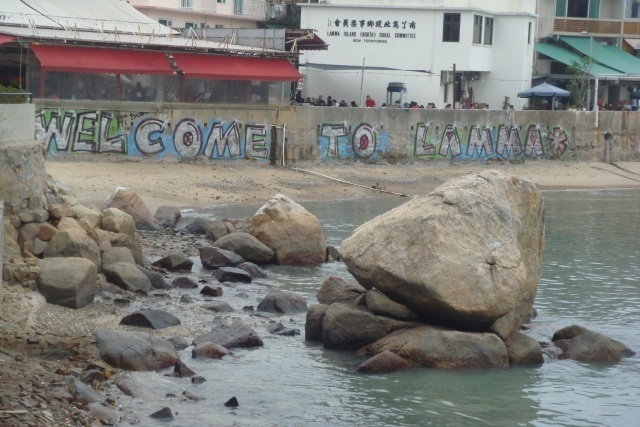 As we approached the jetty of the island we noticed the artistic graffiti sign, Welcome to Lamma painted on the concrete barrier. A warm greeting to an island that is about 30 minutes from Central Hong Kong. 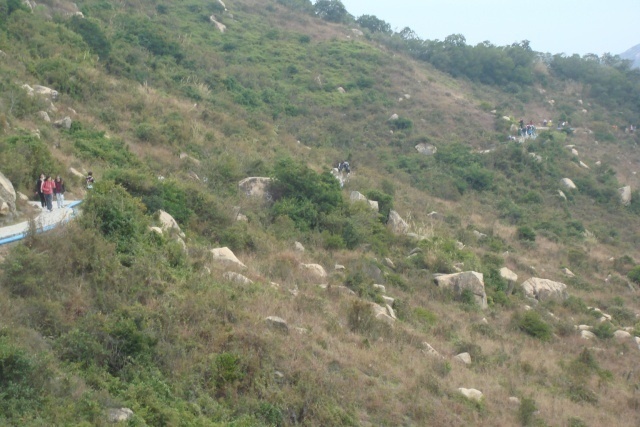 Lamma offers a different side to Hong Kong, an island where there are no cars,roads or high rise buildings. To get around the island you have option A bicycle or option B to walk. The people of Yung Shue Wan, mainly a western community looking for an alternative lifestyle seemed a friendly group. They greeted each other with smiles and stopped to chat , craft shops selling unique hand made goods,cafes serving vegetarian lined the streets, while one man had even set up his own little stall selling second hand books. We sat and watched the local soccer game, two teams mixed with foreigners and Honkanese. It was interesting to see them go about their normal days, living together in peaceful harmony. The little town also had another Tin Tau temple that had been there for over 100 years. It’s nice to see the local culture still exists. Lamma islands other town Sok kwu Wan is on the other side of the island around a 90 minute walk away. 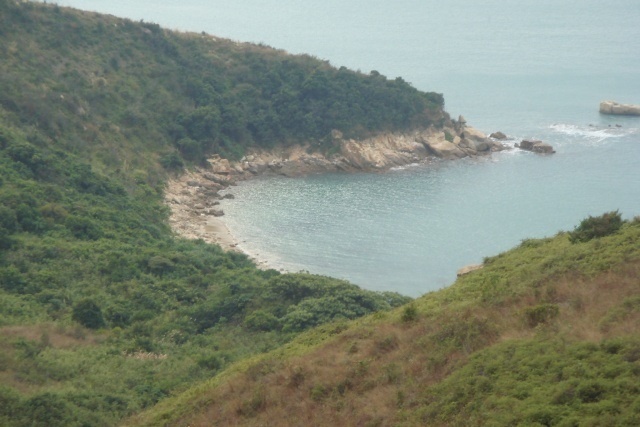 We set out on the hiking track that follows the rugged coastline. Around 15 minutes into the hike we saw two people coming the other way with wheelie suitcases. That seemed strange but around 10 minutes later we came to Concerto Inn, a small hotel overlooking Hung Shin Ye beach. 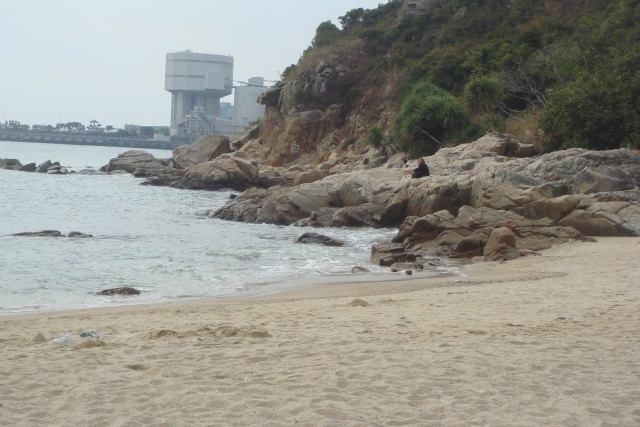 Hung Shin Ye beach is the most well known beach on the island if you looked straight or out to the left it would look like a pretty picturesque beach covered with sand and trees to help shade you from the sun but out to the right on the tip of the cove was a huge power plant. There were lots of other hikers on the path that had been paved by the power plant company. 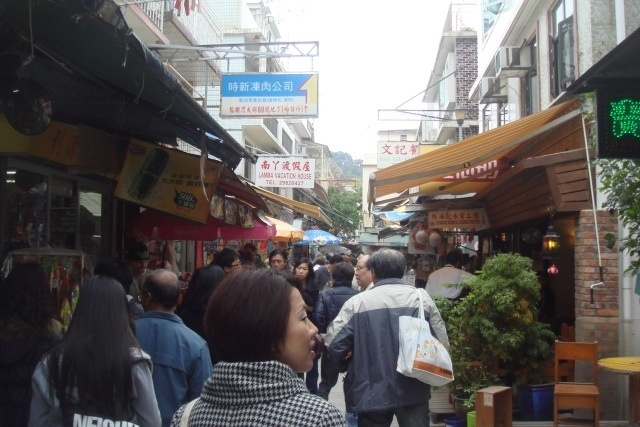 Lamma Island is a popular day trip for the local Hong Kong residents too. The trail weaving along the coast in general offered spectacular views of the sweeping ocean, the curvy beaches down below the cliffs and hidden caves. 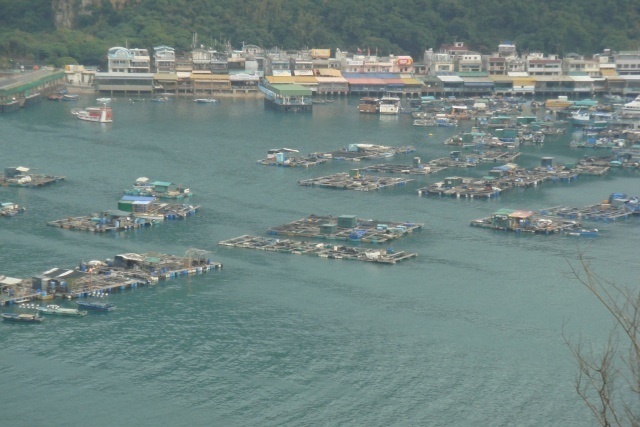 Like most small islands Lamma has trouble sustaining the population with the only industry on the island being fishing. People leave their homes to take up residents in Hong Kong and you can see what has been left of the run down, derelict homes of the people who have been lured away by the bright lights of Hong Kong island. Finally at Sok Kwu Wan, a one street town you will see a plethora of seafood restaurants offering the freshest seafood. This is not fine dining by any means, no linen tablecloths,no fancy decor, just plastic seating outside but what I’ve heard it will be one of the best meals you’ll ever have. 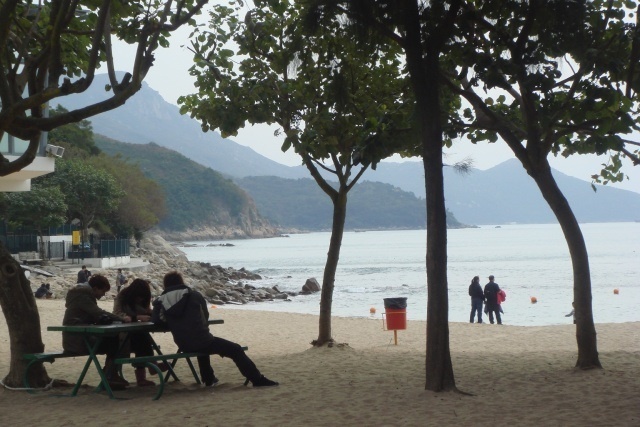 Have you been to Lamma Island? 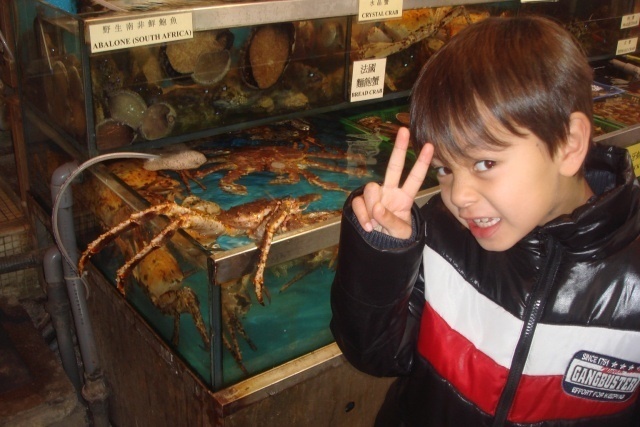 Did you experience the seafood in Sok Kwu Wan? We would love to hear what you thought of the island. 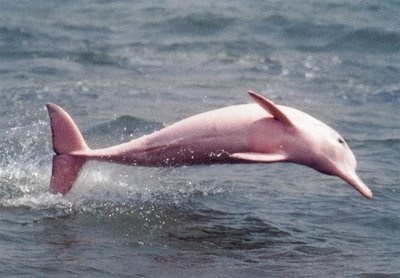 Some might think that the closest you can get to eco tourism in Hong Kong is watching a shark’s fin floating in a bowl of soup but if you are tired of the crowded concrete footpaths, gleaming skyscrapers and glitzy shopping malls why not try to find the endangered Indo Pacific Humpback Dolphin, not only are they endangered but they are also pink,yes you read it right it is not a typo. Only around 150 of these exist in the waters around Lantau Island. In the morning we were picked up in the lobby of the Kowloon Hotel by a guide from Hong Kong Dolphin Watch, which was established in 1995 to increase public awareness of these dolphins plight. Once on the boat we were joined by about 25 other guests. 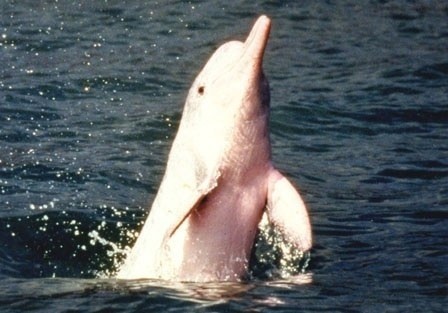 First we were shown photos of fishing nets stuck to the dolphins and another dolphin with a scar below his blow-hole. We were told that dead dolphins are routinely found on the shores of Hong Kong’s beaches, they usually tend to be young, some believe the baby dolphins especially the first ones to be born get a heavy dose of toxins from their mother’s milk. Once out on the sea, taking in the sun on the roof of the cabin, eyes focussing on the water I could see why these dolphins were endangered, the new Hong Kong airport is located near by as well as a huge power plant that Homer Simpson would feel comfortable working in, plus all the boats that also use these water ways. I thought to myself dolphins boats and pollutions just don’t mix. With nearly an hour gone past I was thinking that our chances were slim but our guide hadn’t given up with a 97% rate of finding these elusive mammals she was still as keen as when the boat first started sailing. 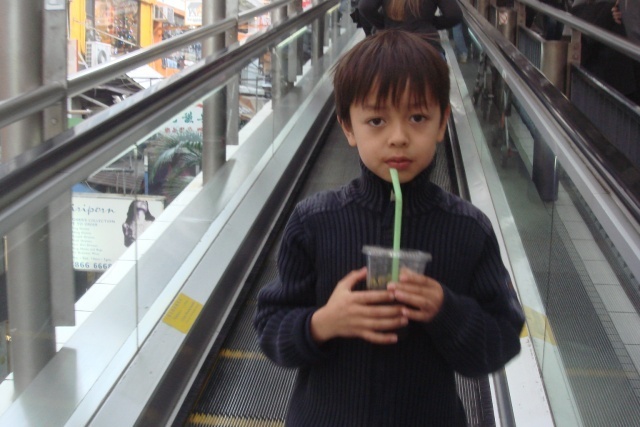 The children on board by now were mostly sea sick and even my son couldn’t help but to contribute to the pollution in the sea. “So why are these dolphins pink ” I asked the guide, who was always keen to answer a question.”Well they don’t really know she responded there are a number of theories, the dolphins don’t have a need for camouflage because they live in brackish water where the river meets the sea, where sharks aren’t found. 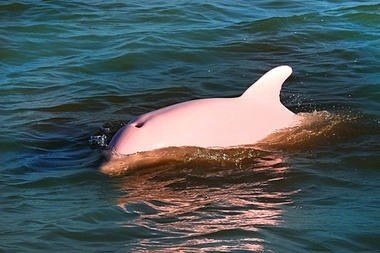 The other one is that the dolphins are actually white but look pink because they are actually blushing while regulating their own body temperature”. Whenever the boat saw a fishing vessel, the boat would turn off its engine and let the boat idle as everyone watched the tail end of the fisherman’s boat where the net entered the water. We were told that it’s a common place to spot them as the dolphins find it a chance at an easy meal. Through the morning we had stopped near three boats but had no such luck but on this occasion the guide shouted “look,look 10 O’clock, there’s a dolphin at 10 O’clock”. Everyone looked where 10 O’clock would be if the sea was a clock and sure enough there was a dolphin. Over the next 30 minutes we spotted a few, even one of the regulars that the guide had named. The dolphins are shy unlike the common dolphin that is often seen in other waters. They did not come near us, or leap out of the water, they were content amongst themselves but wearie of the environment around them at the same time, they did not seem to play but glide through the water, the only time you would see them was when they would come up for air every two or three minutes. As we sailed back I went to the cabin. I had a good look at the photos again and looked outside the window, coming back in view was the airport and I was left wondering what will happen to these dolphins will they survive or will it be just another creature that is lost to this world because of man.